Core's Heavy Duty Spin Bonnet Solution is specially blended for interim bonnet cleaning when a more aggressive formulation is required. 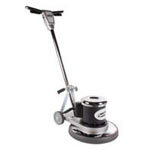 Lifts soil from the fiber tips when used with any of our carpet scrubbing brushes and our low speed floor buffers. Leaves a sassafras scent in the carpet, with a pH cleaning range of 9.0 - 9.5. Use as a maximum dilution ratio of 1 part solution to 10 parts water. 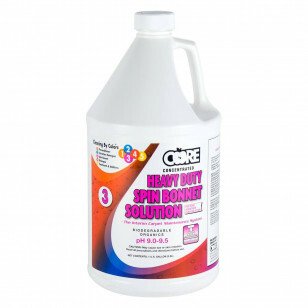 For less aggressive solutions, please take a look at our complete line of carpet scrubbing bonnet solutions.